In our post on the Dell XPS 8700 overview, including a video, I mentioned how we would upgrade the mSATA SSD on the motherboard from 32GB to a larger Solid State Drive that we could run everything from. The original Dell configuration (which was not done correctly…) was to have the small – by today’s standards – 32GB SSD act as a cache for frequently accessed data on the 2TB 7200rpm conventional SATA hard drive. Windows 8 does run better with an SSD cache, but if you can keep your really big files on a partition other than your Windows partition then why not run everything on a super fast SSD and speed up your PC as much as possible? I have been running on SSD’s for several years now and writing about the performance benefits. So the only difference on this Dell XPS is that since it has a mini-SATA or mSATA on the motherboard it’s the obvious choice for my SSD upgrade. 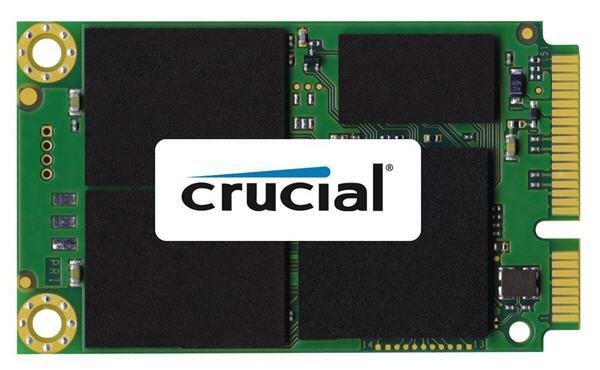 The cost of an mSATA SSD over 2.5″ model is only $10 on the Crucial m500 I bought. That $10 price advantage, BTW, would be negated by the 2.5″ to 3.5″ drive adapter I would have to buy in order to mount a 2.5″ SSD (perfect size for laptop) in a desktop PC. I really don’t know if the mSATA on the motherboard is better performing than a conventially installed SSD; it kind of makes sense that it COULD be, but it does save a hard drive slot if you want additional drives mounted inside of the computer case and results in fewer cables tangled up in your case. Should I ever want to use the mini-SATA SSD elsewhere on a PC that does NOT have the mount on the motherboard, simply spend $10 on an adapter and you are good to go. In fact, that is what I am doing with the 32GB mSATA from the Dell XPS, putting it on a Syba mSATA SSD to 2.5-Inch SATA Adapter (SY-ADA40050) and installing in an Asus EEE PC for a great speed up on that machine. And 32GB is plenty for an EEE PC. As you can see in the video below, installing the mSATA SSD on the motherboard is quick and easy. Here are the steps. If the mSATA is currently being used as a cache, I would suggest disabling cache and freeing up the mSATA using the software provided by your computer manufacturer (Intel in my case). Place on static free, clean, workspace. Counter tops are fine but if you can NOT be standing on carpet all the better. Use an anti-static wrist guard if necessary. Take the cover off the PC and WAIT until any glowing LEDs on the motherboard go out. LEDs lit indicate there are still traces of power in the system. See BIOS settings screen shots here. If you have time, I would like a little more information on this upgrade. in replacing the 32 GGB SSD with a larger one and making this my root drive for OS and applications. I have read that Dell has the Windows 8 verification code (I may have wrong term here) in the BIOS which makes reloading Windows 8 onto a different drive problematic…. is this true? If so any suggestions about how to do this. Also – if reinstalling Windows 8 on SSD is possible – can you provide more detail on how to disable using the SSD as cache? At this point I cannot do a video on disabling the cache, but someone else probably has. The nice thing is that completely remove the big HD from the system, so if all goes south you can put that back in. Once you know you don’t need it just install in the system (or simply re-connect) and delete the partitions on it, recreate a partition & format. Takes seconds. When I installed the big SSD I installed Win 8.1 Pro from DVD – that I had bought. But I did install the version 8 from Dell’s DVD onto a Virtual machine and it went through smoothly, so should be no issue for you. One thing I did have to do in the BIOS after disconnecting the big drive and installing the larger mSATA was to change from RAID to AHCI. Then I got a prompt to press any key to boot from CD/DVD (which I had inserted) and then WAIT! it took long enough I almost thought it was locked up – maybe 30 seconds to a minute. Hope that helps. If so, please consider buying your mSATA through my link in the post. That helps pay the site costs. Hello Roger, I followed your directions, I have the same computer (XPS 8700 no msata version) and I just installed a crucial M500 480GB but I am having problems. Basically, I managed to set up the dvd rom to load first, Win 7 installation starts, I don’t click install, I go through Fix or repair, then it’s supposed to give you the available drives, unfortunately, the drive does not appear. If I restart the computer and click on f12, under legacy boot I see the crucial ssd named, I also changed the bios for the dvd rom to be the primary drive, since I was getting a secure boot violation, so I disabled secure boot. I also tried changing it from RAID to AHCI and vice versa and nothing happens. The 1TB HD is disconnected, I have a brand new copy of Win 7 and don’t know what else to do to get it working, your help would be greatly appreciated it. What’s the reason you don’t just click “install”? Or did you try that already? You can also try re-connecting your HD and have the SSD as just another drive. Let windows boot from your 1 TB drive and see if the M500 shows up in disk manager. I would then see if you can create a partition on the SSD, format the SSD (making sure you format the new, blank drive!) and can copy data to it – as a test. You can then delete that partition after the test. I was following the first procedure. I purchased a XPS8700 with 1TB HDD, 8GB RAM, no SSD. I purchased separately a mSATA SSD 32GB. I was informed that with the mSATA SSD, the XPS would boot very fast and perform better overall. Dell sells a XPS8700SE which comes already with a 32GB mSATA SSD drive, however, the OS is still installed on the HDD. According to Dell, the 32GB mSATA SSD is used as a very fast cache. I asked Dell support if I could just simply add the mSATA that I have purchased separately to get the better performance but they told me that adding the mSATA to the XOS8700 that came without any mSATA originally, would not improve the performance at all. They say, that the MOBO of the one that comes already equipped with the mSATA has a different configuration than the one without. When I asked them about the configuration change, they told me that the MOBOs are different and not only their configuration. So I’d like to know if I can add a 32GB mSATA SDD to my XPS8700 and mostly, if it would then perform any better. Maybe there is something to be done in order for the OS to recognize the newly added mSATA SDD to use it as a cache. I might even want to purchase a 256GB mSATA SSD and install my Windows 8.1 PRO from scratch on it. I have created two factory setup DVDs after the installation, so I guess I could re-install everything. I jsut purchased The Samsung EVO 840 1TB mSATA for my Dell 8700 and viewed this for some tips. I didn’t really get anything out of this video although I thank you for doing it.I’m more interested in knowing if there are any BIOS settings that need changed to make msata bootable and keep the other hdd’s for expansion. The intel utility needs to be set so that the SSD is NOT used for caching; then it is available to set as a boot drive. Great video. Thanks for sharing. I have a question for you: Do you know what Disk #’s (Disk 0, Disk 1, etc) were assigned to the original 32GB mSata and 2TB HDD (via diskpart or computer management)? And are the Disk #’s, now (after the mSata upgrade), the same? I have a new XPS 8700 with factory installed 256GB mSata (assigned Disk 1) and 2TB HDD (assigned Disk 0) and I was curious if your system has the same Disk # assignment. I would have thought the Boot Disk (the mSata) would always be Disk 0 because it’s installed on the motherboard. Do you think you can make a video loading the OS on the msata? I watched your video quite a few times and it was very instructional as well as entertaining, so I decided to purchase an SSD to be the primary drive. I bought a Samsung 850 EVO – 250GB – mSATA Internal SSD (MZ-M5E250BW) that it was highly recommended by a college at work, but guess what, it does not include the mounting screws which are not in the motherboard, and I don’t know where to get them, I have contacted Dell/Samsung and they say to buy M2 screws. If you have them, I am willing to pay for them and I will be very appreciative for your help. Either way could you please let me know.